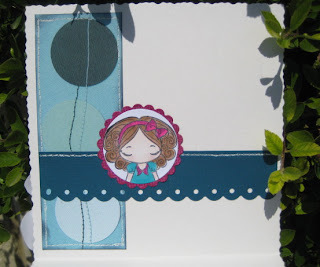 The challenge was a free for all with colours and sketch so plenty of variety to work with!. I used an Anya image kindly sent to me by Tricia with papers by the Craftwork at a bargain price form the Art shop in Stroud at 25p - and that was the actual price and not the usually halved price reported back to any non crafter who asks!! I coloured both flower, rectangle nestie scallop & ribbon with the Maroon marker to try to match (the ribbon was a fluorescent pink!). Buckle is SU hodgepodge and brad is I think doodlebug. The larger flower is one I cut out from the papers and simply bent around my fingers. Lots of pricking and faux stitching - I love doing this and think it works especially with the stitching on the papers . 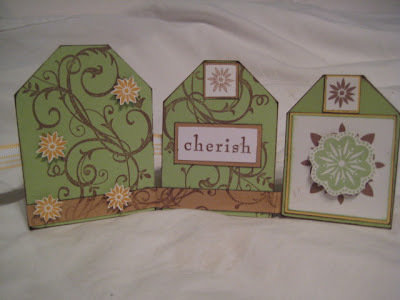 I mentioned before I like to decorate the inside of cards so repeated the image on the inside. 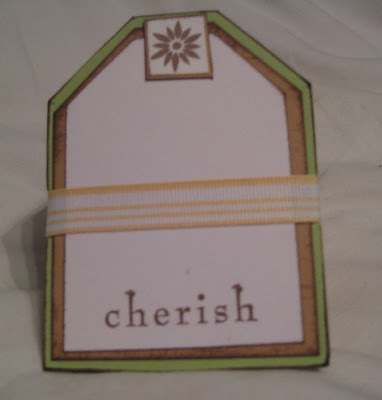 and created a simple frame with charm from my stash for any type of sentiment. Just now wonder who I can give this too!!! 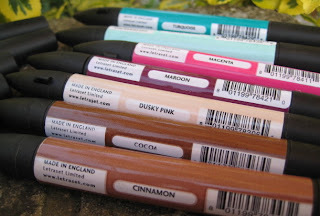 I have to go and buy some more markers as typical for the next challenges I have one of the colours but not the both..... a trip to Swindon me thinks as there is a shop there that stocks them. 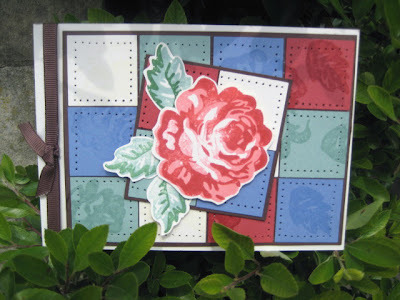 Yes, I have been good and made a few cards today - I know the weather has been beautiful but I am really fair skinned and do the white, red , possibly a bit beige then white again. So have spent a few hours in my garage, watching Britain's got talent and playing craft!!. 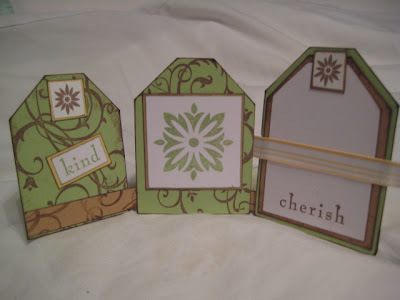 I now have a number of cards that I can do the automatic posting thingy as I know I have a busy time at work next week!. I have made my Dad (85!) 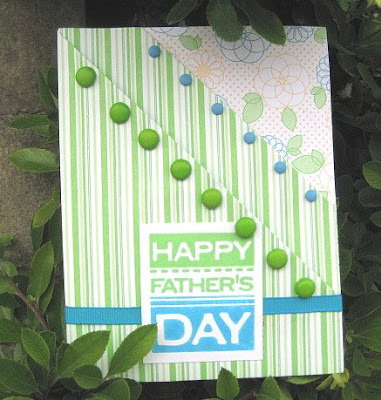 a card in advance & intend putting in a couple of vouchers for his local garden centre and art shop. 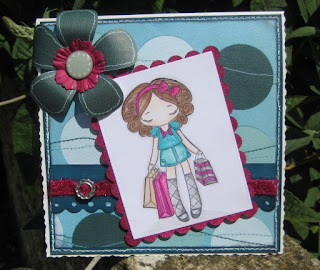 And here is my first card for ages! 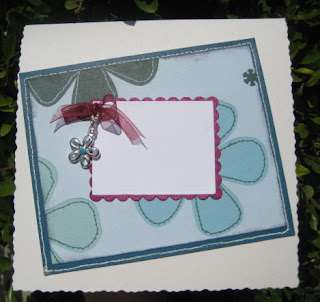 I also have a thing about the inside of cards - so had a go at decorating that as well. 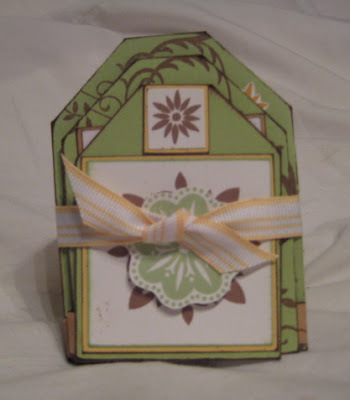 The light in the garage isn't too great but the bush just outside is a ready made card holder. I will have be careful later as this bush had really sharp thorns when the berries come on it. Can you tell I'm no gardener as I have no idea what its called only the scratches! Can't quite believe its been that long since I got along to blogging again. To be honest every time I logged on and looked at my fav blogs & site my lack of actually doing anything blog wise was like the "elephant in the room" ! I've found I spend so much time admiring everyone elses creativity and wishing I could think of things that I never get around to doing anything at all. I compulsively ( and yes it is my disease) want, need and buy lots and lots and lots (if huband reading this - all at remarkably affordable/bargain prices), loving rearrange storage boxes, stroke lots of paper that all I end up doing B***er all. winter I know I will have to bring in my card & paper BUT ITS A SPACE :)))))) that I can leave messy if I want. I have only only photo to share at the mo as the rest of the garage was really awful ( I also keep my tumbling & ironing in there as well ) but will pluck up the courage to take a few more later. On the top are all my ribbons & flowers in good old Ikea glass jars & the wicker basket hides all my SU stamp sets. Hidden as it has somehow filled up over he last couple of months.... not admitting to number but a lot less than my friend & upline Jane! On the desk itself the blue draws house my clear stamps, some pen markers then my bday prezzie the ink caddy thingy with gaps to fill, some storage boxes with not sure what t do with stuff but need to hide it away things! My tool box, one side SU & the other all my other essentials of the moment and my lovely scor-pal. I'll "do" the cupboards later as this is really probably too long a post. I have prepared some flyers to publicise a workshop at my home making this so will hand them out tonight - Again hope I get some interest . Better go & wish me luck!! 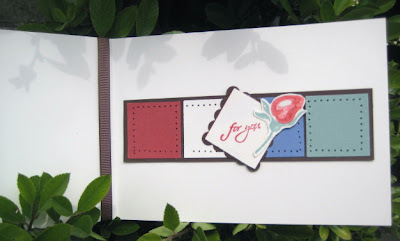 Whilst I haven't been blogging I have however become a StampinUp demonstrator and am quite excited. I have bought some stuff but am yet to host a workshop - need to find a friend!!. I have also attended some team training down in Fareham last Saturday and it was a great day. Learned lots, met some nice people, laughed lots, and made some lovely stuff. Thanks to Amanda for great organisation. As part of the day we where given "homework" and this post is my effort!. We have until tomorrow night to submit so I can't believe that I have completed well before a minute to go.... wish the rest of my life was this organised!!! !